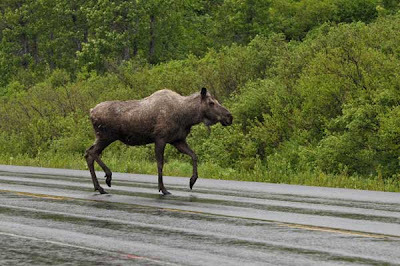 My posts mostly featured the beauty and wildlife of Alaska, as seen in many of these protected lands, but I thought it would be appropriate to show some of the other sides as well. One of the biggest industries in Alaska is tourism. No where is that more apparent than in the towns of southeast Alaska where there are docks for multiple cruise ships. Each ship dwarfs the town beside it and often flood the streets with more tourists than the total year-round population of the town. Many local businesses open and close based on the arrival and departures of the cruise ships, which can have them running some odd hours. 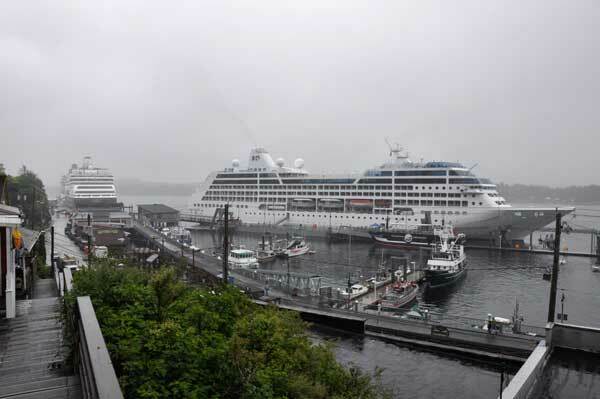 Here are two ships that were in port in Ketchikan. 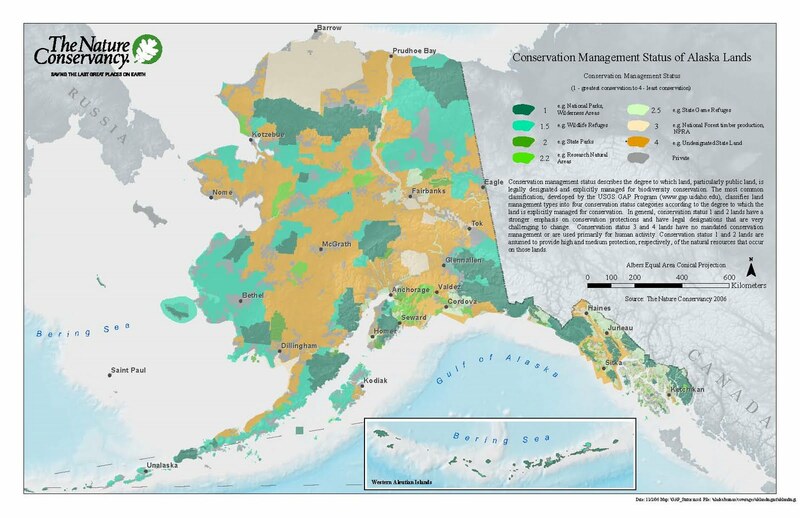 Aside from tourism, and especially in the interior or more remote lands, Alaskans often make their living directly off the land. 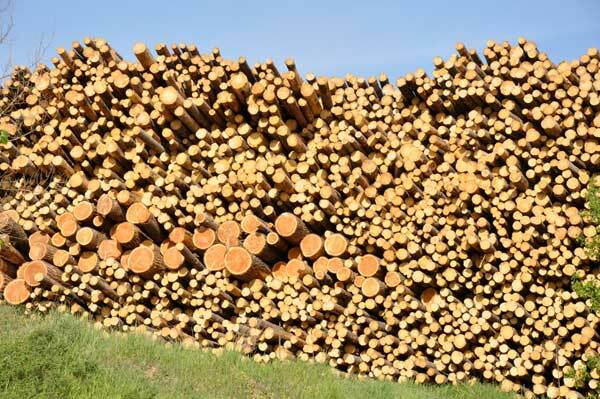 Many of these issues are controversial, especially when it comes to issues of conservation and native rights. 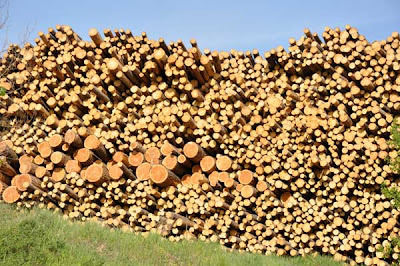 I won't comment too much one way or the other here, but from what I read and heard harvesting - whether it be trees, fish, or oil - is often highly managed and takes many different interests into consideration. In Homer, we saw this fisherman filleting an impressive 210 pound halibut. 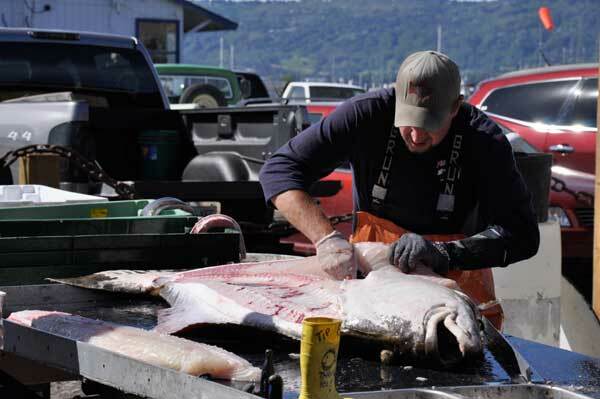 It wouldn't be big enough to win one of the popular local fishing derbies, but it still drew congratulations from visitors and locals alike. 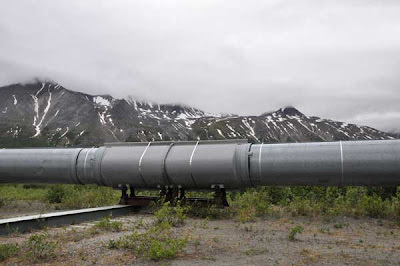 It was interesting to see the pipeline up close, too. 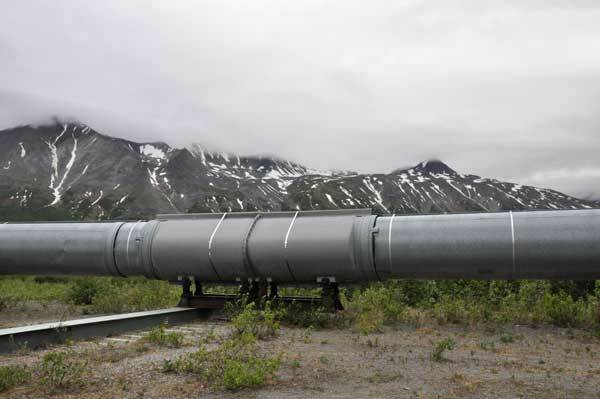 The big beams under the pipeline as shown in the photo below allow it to shift without breaking, whether minor moves from frost heaves or from something more major like an earthquake. 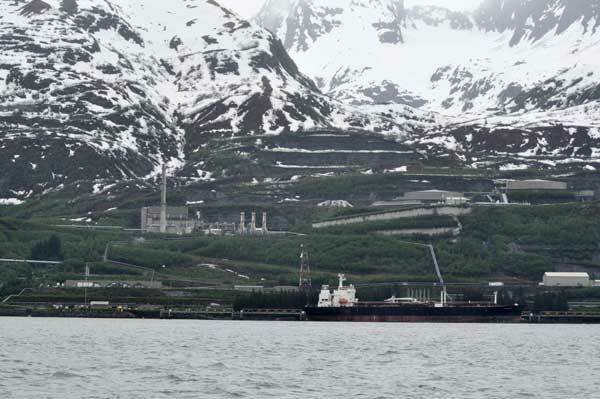 When in Anchorage I met up with an old friend that now works in the oil fields at Prudhoe Bay, and it was interesting to hear about the strict environmental codes and regulations they have in place up there to minimize their impact. 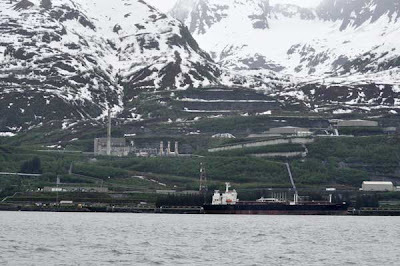 He actually said Prudhoe Bay was the cleanest and one of the most environmentally-friendly towns he had ever seen. It was actually kind of reassuring to hear about all the strict protocols they had for operations on the land-side of the US oil industry. If only such practices and plans had been properly utilized in the Gulf of Mexico. After a fantastic five week trip to Alaska, where I saw loads of wildlife but no killer whales, I was more than ready to see the orcas that have been spending a lot of time around the San Juan Islands over the last month while I've been gone. I got off the ferry Friday afternoon, unpacked, and went to the westside where I arrived just at the same time as part of J-Pod. I saw them from shore again yesterday, and then today had my first trip back with Western Prince. Three days at home, and three orca sightings - not so bad! 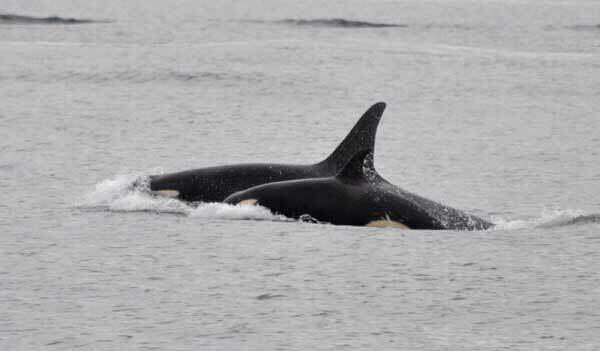 After not seeing orcas in Alaska it makes me realize how lucky we are to have the orcas hanging around so often here. As if the great afternoon with the whales weren't enough, on the way back towards Friday Harbor in addition to a few flocks rhinoceros auklets, two bald eagles, and a bunch of harbor seals foraging in the currents of Cattle Pass, we saw a tufted puffin! I saw lots of puffins in Alaska but puffins are a pretty rare sighting in the San Juans, so it was a very exciting find. 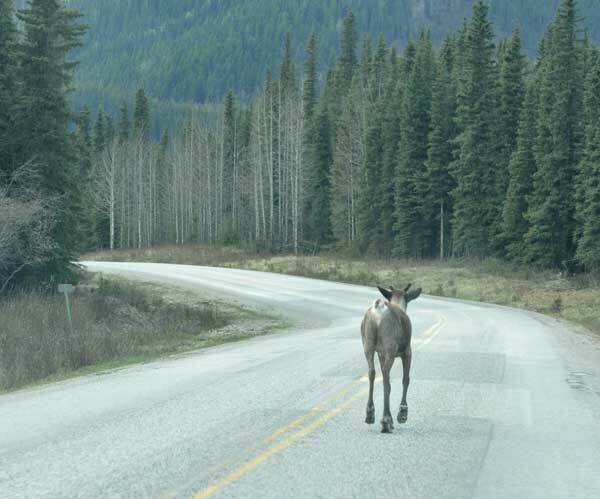 When you build a road through the wilderness, it is inevitable that large animals will find their way onto the pavement, creating potentially dangerous situations for both wildlife and drivers. 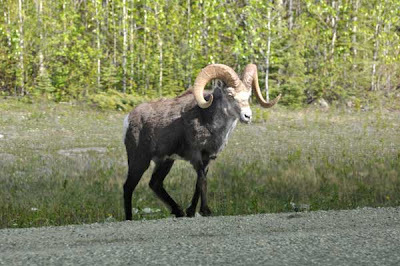 It also creates some amazing wildlife viewing opportunities. 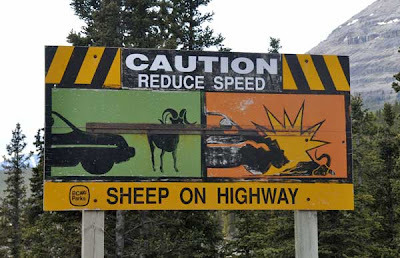 Early on our trip I was intrigued by the signs warning drivers to look for everything from moose and caribou to sheep and wolverines on the highways. We ended up seeing many of the species right where predicted. 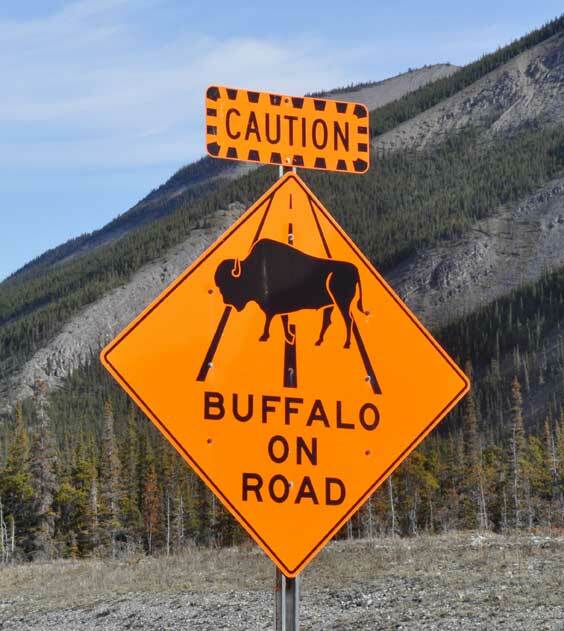 Here is a little series I put together showing the often creative signs and the animals on or near the roadway. I think these photos demonstrate an interesting juxtaposition between wilderness and civilization. Most of these photos were taken in the Northern BC Rockies, and the others on the Kenai Peninsula in Alaska. We had a very wet day exploring Ketchikan on foot before boarding the MV Columbia for the final leg of our voyage back south. I should have worn the rain pants before heading out, but that’s one of those mistakes you have to make several times before you learn. Instead, I switched to the rain pants while the jeans dried in the car. Don’t we look like we’re having a good time? 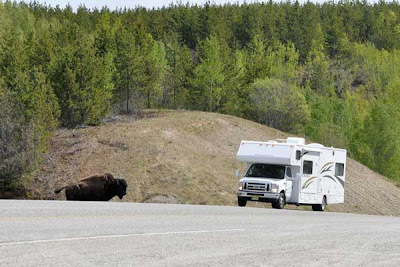 Our journey north was full of excitement and anticipation. 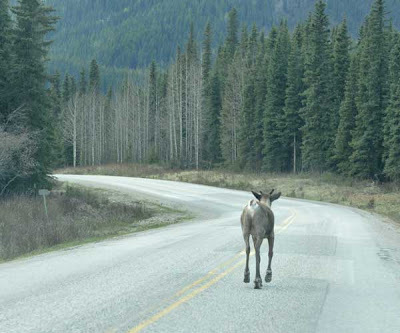 There was lots of stopping to take pictures, new animals to see, talk and speculation about what was to come. 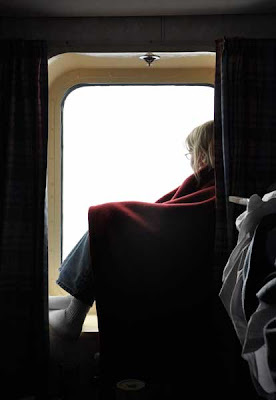 The trip back south is instead about reflection, quiet time looking out at the passing scenery or talk of the highlights of the last five weeks. The end of a trip is always bittersweet – so many good times were had and is sad it is coming to an end, but home is starting to sound pretty nice, too. When we traveled north on the Alaska Highway we would leapfrog other travelers or talk to folks pulled out at view points or at hotels. It’s different traveling there than in other places because there is only one road, which means only two directions to go. The early conversations inevitably lead to the question, “Are you going north or south?” We met the northbound motorcyclist from Vancouver, Washington who needs to go on a several thousand mile bike trip every year or he gets restless. We met the father helping his Alaskan-born son move south to take a job in Colorado. 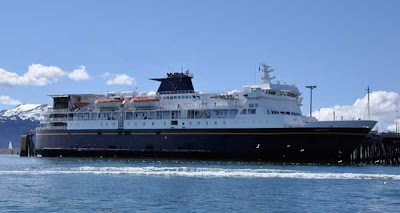 It is similar on the Alaska Marine Highway, where despite our ferry hopping and overnights in coastal towns we somehow end up again with the same people on different ships. 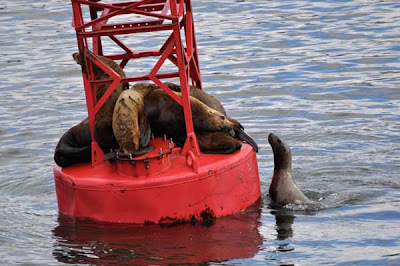 There are several different places to hang out on the large ferries, so we meet the others that station themselves with us in the forward observation lounges looking for wildlife. There are the birders from New York who went to Gambel on St. Lawrence Island way up north and saw 32 life birds in four hectic days of bird-watching. The woman relocating to Ketchikan after working as a mental health care professional in a remote native community. The European travelers from the town where my mom went to high school. The family relocating from the Air Force base in Anchorage to one in Salt Lake City. It is an interesting sort of camaraderie that forms, traveling this way. I’m not a big fan of air travel anyway, but this trip has reinforced to me the benefits of traveling more slowly by land or sea. If we had hopped on a plane in Seattle and gotten off a few hours later in Juneau or Anchorage or Fairbanks I would have missed so much of the sense of place that is Alaska. I would have had no real concept of how far away from home I was, or how much open space and wilderness stands between those two places. With this type of travel the experience is the journey itself rather than a particular destination, and I like it that way. Even by car or boat I realize we can cover hundreds of miles in a day, and I can only imagine what it must have been like to those early travelers who walked their way south from the Bering Land Bridge or explored these complex islands and inlets by sailing vessel with no charts to aid them. Enough of those philosophical thoughts for now, let me share some of the sights of the day. After boarding the ferry yesterday afternoon we headed south as far as about Prince Rupert before it got too dark to see; darkness is still a concept I’m readjusting to, I have to say it is very strange for it to be dark by 10 PM again! This morning I woke up to the rocking during one of our two open water crossings and was again greeted by rain. The weather lifted throughout the day, progressing as we do towards the clear skies and warmer temperatures that have been reported at our port city in Bellingham. In the inside waters we’ve seen a series of lighthouses in all different shapes and sizes. 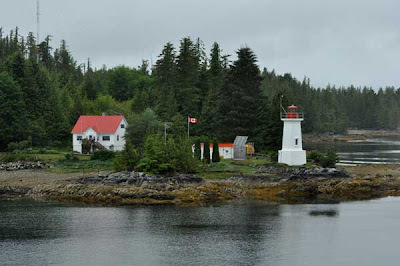 This is the Dryad Point Lighthouse in British Columbia. There are lots of interesting vessels to see as well, like this freighter loaded up with everything from cargo containers and construction supplies to boats and trucks. 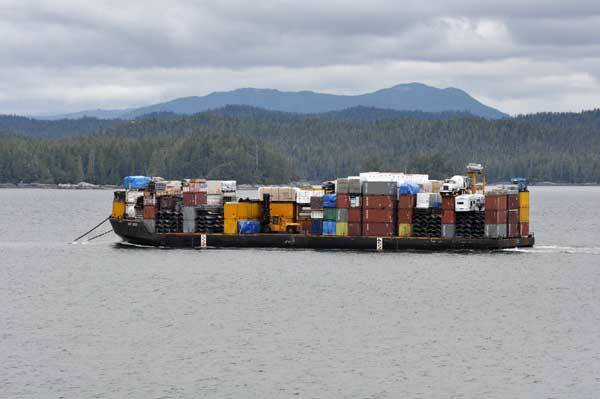 It looks a lot like the monthly shipment we saw being unloaded in Yakutat. I wonder where this one is headed? While we saw a few humpback whales in inside waters throughout the day the whales of Queen Charlotte Sound were the most impressive wildlife sighting of the day. At one point it seemed like there were spouts every where you looked, there were so many whales around! Often when a whale is spotted you will see it once or twice more before it dives and then the ferry moves you along and too far away to see it again. A couple of times I tried going outside when it looked like a whale was close enough to photograph, and once today I was rewarded. 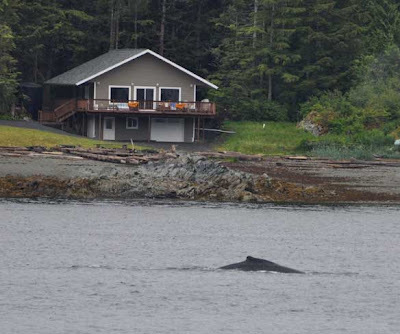 Before we got to the big group of whales in the Sound, we saw this single individual. As me and one other lucky soul stood out on the deck, the whale came up directly off the ship from where we were standing and only about 25 yards out! It was so close I could hear it breath over the engine noise. Later in the afternoon we reached the northern end of Vancouver Island and entered the waters that are the primary summer home of the Northern Resident group of killer whales, the counterpart to our Southern Resident population in the San Juan Islands. 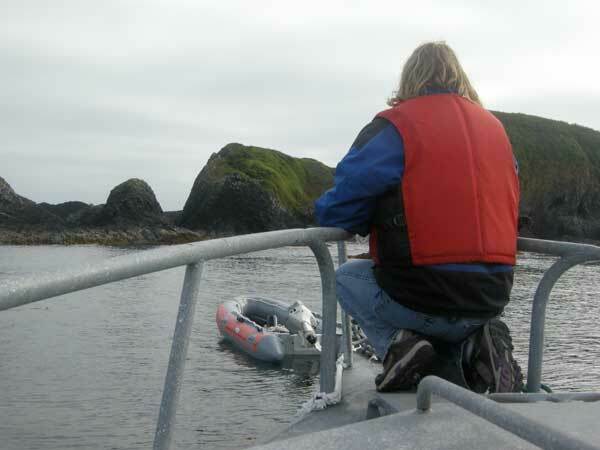 We didn’t have any luck with orca sightings today. (I’m disappointed but can’t complain that we didn’t see any orcas in Alaska – an interesting fact to me since Alaska is where my passion for them bloomed when I was 12!) 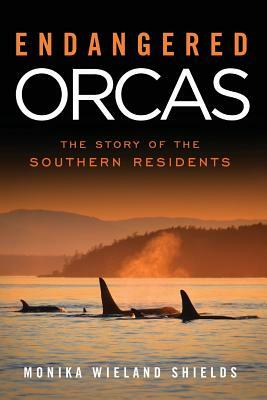 Despite the fact that we didn’t see any dorsal fins it was still cool to transit through the areas I have read about it books such as Orca: The Whale Called Killer and Listening to Whales – both of which I highly recommend, by the way. 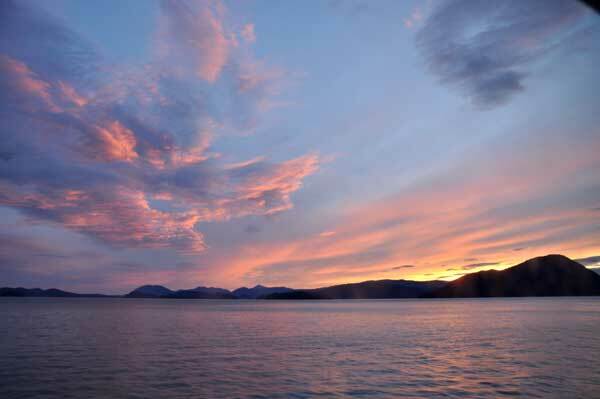 Places such as Blackfish Sound, Alert Bay, Cracroft Island, Robson Bight, Johnstone Strait. 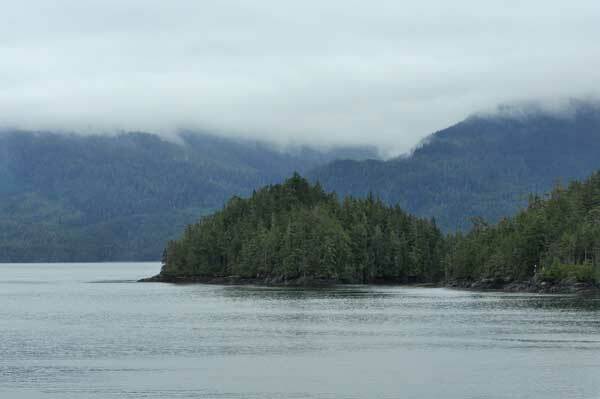 I can just imagine the orca dramas that play out here later in the summer when the Northern Residents are around more often, or the Southern Residents transiting through when they make the occasional trip down the Inside Passage as part of L-Pod did just a week or so ago. 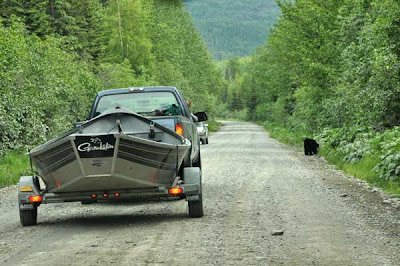 Here is a picture I took in Blackfish Sound. 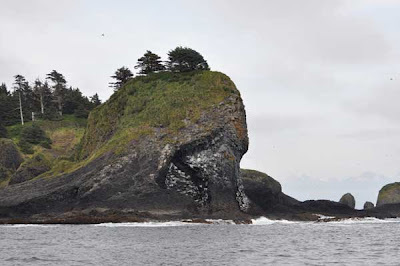 Looks pretty similar to the San Juans, doesn’t it? That’s probably why I didn’t take as many scenery pictures today. 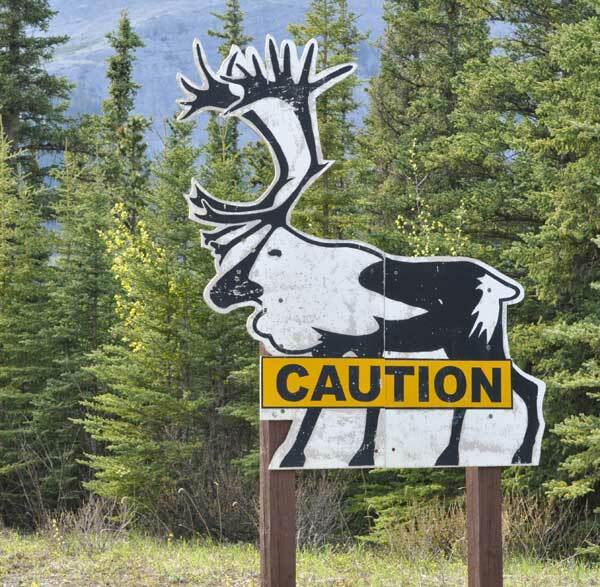 I won’t be able to post this until I’m back at home, so this will be my last blog entry written from the road about our epic trip to Alaska. Tomorrow morning we pull into Bellingham and I’ll catch another ferry back to my home port of Friday Harbor. While I’ll quickly re-enter the summer swing of things there, including catching up with the Southern Residents that have been around a lot, I’ll still do a few more posts about the trip with some photos and thoughts that just haven’t quite fit in anywhere else. What can I say, it’s been a heck of a trip! I hope you have all enjoyed following along, as it has truly been the experience of a lifetime. The last two dream-like days of getting up before 4 AM to catch and disembark from the ferry have strangely blended together. Sleep has come in fits and starts and the days seem really, really long, even though it is starting to get darker as we head further south again. 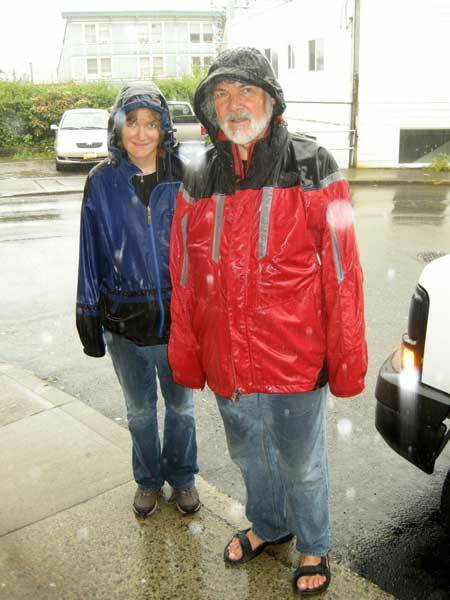 In the process, though, we have moved from Sitka to Ketchikan, our last Alaskan stop before heading home. This morning we found ourselves off the boat and in Ketchikan at 4:15. It was raining, which shouldn't be surprising for a place that receives upwards of 13 feet of rain a year, compared to a place with a wet reputation like Seattle that only gets about 3 feet. At least it was light out, so we drove around for a while on some of the roads outside of town. We went out for an early breakfast and one it was late enough to conduct business we parked near the harbor so my dad could get something done by phone since we've been without internet on the ferries. While sitting there I was extremely surprised to spot a humpback whale just offshore in the middle of downtown Ketchikan! The whale surfaced just a few hundred yards off the nearby docked cruise ships. I took this photo from shore and as you can see the coast of Pennock Island was not far across the way. Very cool! Next we did a series of short hikes just outside of town, including the loop at Totem Bight State Historical Park. 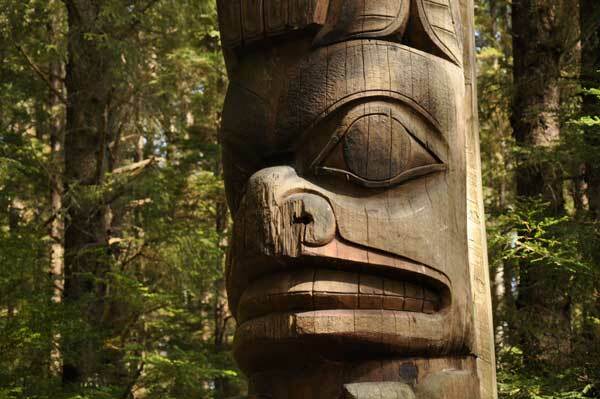 Ketchikan is known for being home to the most totem poles in the world, and here were representatives of those of both the Haida and Tlingit traditions. This is a model of a clan house, a large single-room building that would house anywhere from 20-50 people of a related lineage. 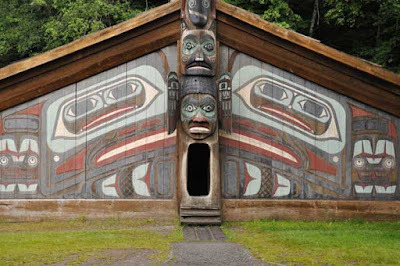 The painting on the front is of a stylized raven, a very important figure in local native mythology playing the role of both the trickster and the creator. It was appropriate to have ravens calling above while I took this picture. We also hiked the loop at Lunch Creek Falls at the "end of the road", so known because like Sitka and Juneau, the roads in town lead no where else as the city is only accessible by boat or plane. 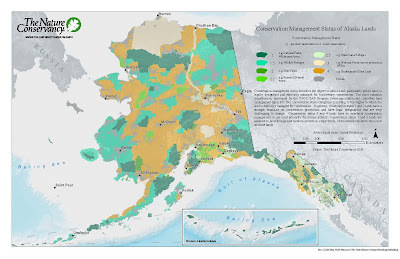 The whole area here is part of Tongass National Forest, which at over 17 million acres is the largest such forest in the country. It is a lush temperate rain forest very similar to those I'm more familiar with in Oregon and Washington. 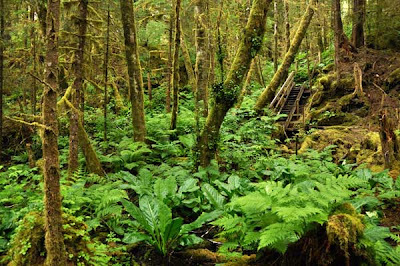 Conifers, ferns, and mosses dominate, but if you look closer there are subtle differences: western hemlock instead of Douglas fir, wood ferns instead of sword ferns, bunchberry instead of trilliums. But still, countless shades of green. Tomorrow we will spend most of the day in Ketchikan before getting on a late afternoon ferry that will take us south to Bellingham. I am looking forward to this section of the trip as it should be both beautiful and good for spotting wildlife. 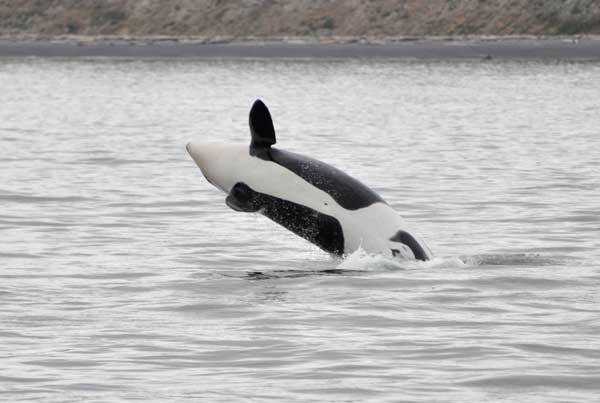 Can you believe I have yet to see any orcas in Alaska? It wasn't the primary goal of this trip but with all the time spent out on the water I'm a little surprised, since this is the place I originally fell in love with them. Perhaps along the inside passage near northern Vancouver Island. 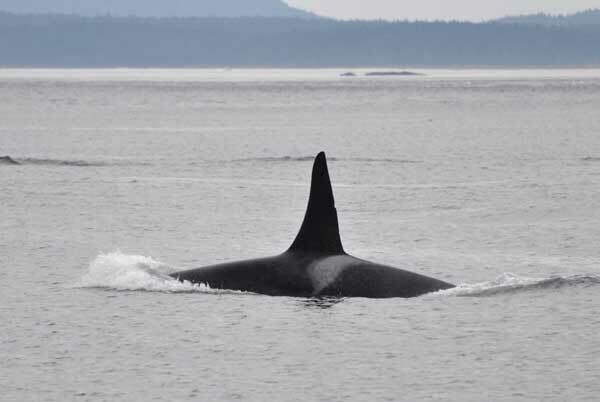 In any case, by the end of next weekend I will be back on the water in the San Juan Islands where all of the Southern Resident orcas have returned for the summer and have been spending a lot of time in my absence. It will be good to see them, and all my friends there. The sights have been amazing but after more than a month on the road the concept of "home" is starting to sound pretty good. My next post about the end of the trip may very well come from Friday Harbor! 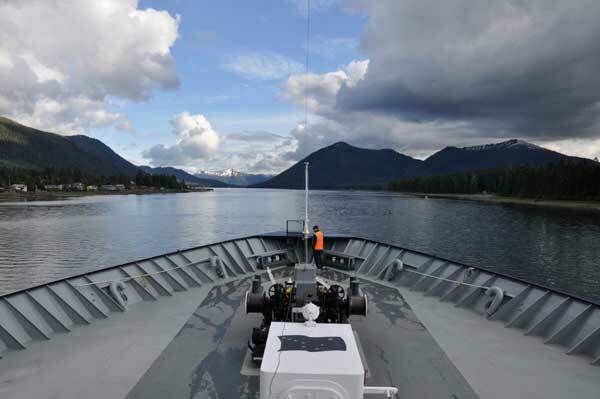 Yesterday we departed Juneau aboard the fast ferry Fairweather for a four hour ride to Sitka on Baranof Island. 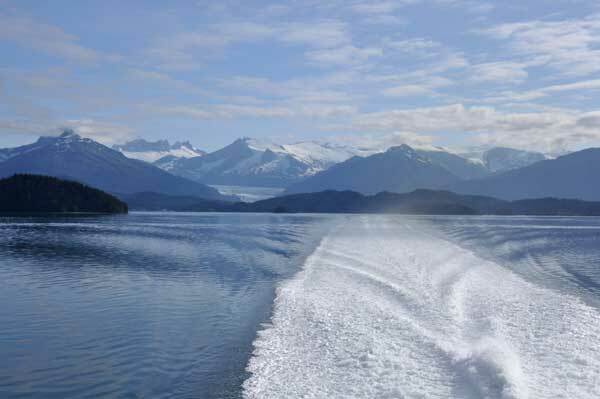 The weather was once again cooperative and it was a beautiful ride through this part of southeast Alaska. Narrow, deep channels rich with wildlife surround numerous tree-covered islands. It's similar in a lot of ways to the San Juan Islands, but this region is much, much larger and surrounded by true wilderness - it's easy to see why I love it so much here. Here is a photo taken looking back off the ferry, with Mendenhall Glacier visible in the distant mountains. Sunny weather met us in Sitka so we decided to go for a hike at Sitka National Historic Park, which shares information about the Native, Russian, and American history of the region. It also features several totem poles, primarily from the Haida on nearby Prince of Whales Island. The highlight of the day (and it had already been a good day!) was a late afternoon birding trip to Saint Lazaria Island, a 65-acre island that is part of the Alaska Maritime National Wildlife Refuge. 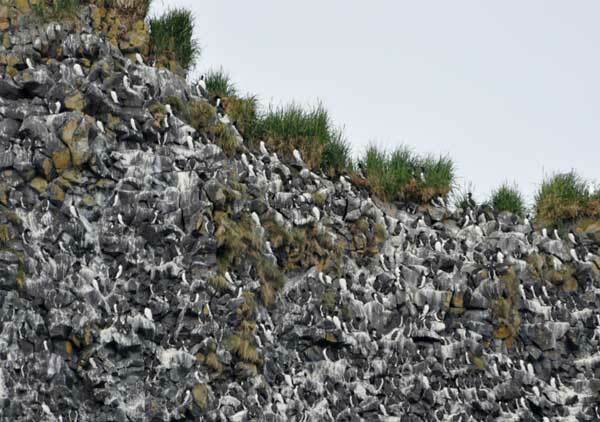 It was originally designated a marine bird refuge in 1909, one of the first of its type, and is home to nearly half a million nesting sea birds, though you don't see nearly that many because most, like the 250,000 storm-petrels (!!!) only return at night to feed their young. Saint Lazaria is a striking volcanic island, formed as a vent of the nearby volcano Mt. Edgecumbe. At its highest point it is 160 feet, and the only tree found on the island is the Sitka spruce. When we first got to the island I got to be the mailman for the three researchers that are living on the island this summer studying the sea birds. I climbed up to the bow and dropped a plastic-wrapped package into their dinghy. But we did have success! The other colony, which was interestingly under a overhang in what almost looked like a sea-cave, had some birds perched facing outwards. The white mandible line wasn't visible, and our captain explained you can only see it at close range in good lighting, but this photo shows the slightly distinct white chest markings. 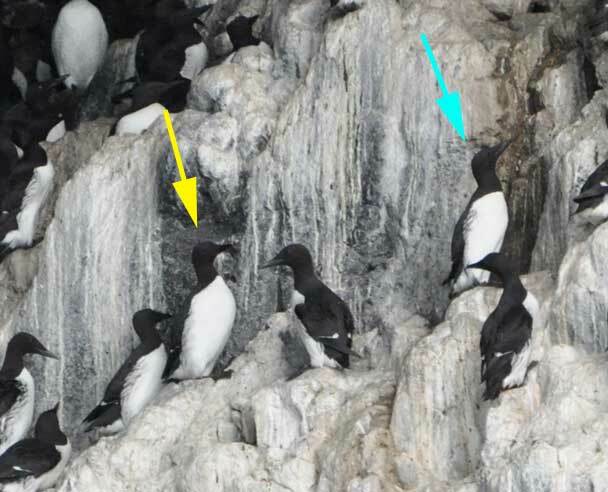 The blue arrow points to the common murre where the white is rounded off on the chest, and the yellow arrow points to a thick-billed murre (year bird 211, NA life bird 335) which has the pointed white on the chest. Amazing that they're considered different species, especially because they're in mixed nesting colonies! Another leucistic bird? It's amazing, as I had never seen one before, but on this trip I have seen a leucistic red-tailed hawk, cormorant, and now this murre. 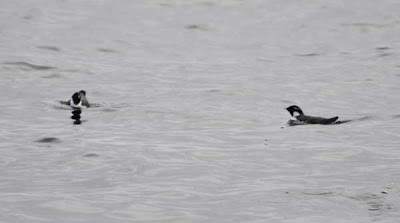 On the way back towards Sitka another surprise popped up - a flock of ancient murrelets! This is the closest view I've ever had of this bird, and an early Father's Day present for my dad who was disappointed to have missed this species on our cross-gulf ferry trip. 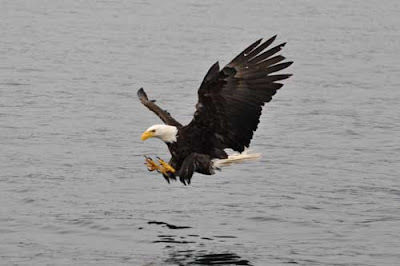 I posed the question earlier in the trip as to whether or not I would tire of bald eagles by the end of the trip - which are, in fact, "like crows", especially in southeast Alaska. With the 20 eagles in the bay at Yakutat to the dozen eagles swirling over the highway in Juneau to this encounter yesterday, the answer is that I definitely haven't tired of eagles! Today we had a lazy morning before two very early ones that are upcoming for our departure and arrival of the next leg of our ferry. Then we took advantage of the continued nice weather and took a couple of hikes around Sitka. 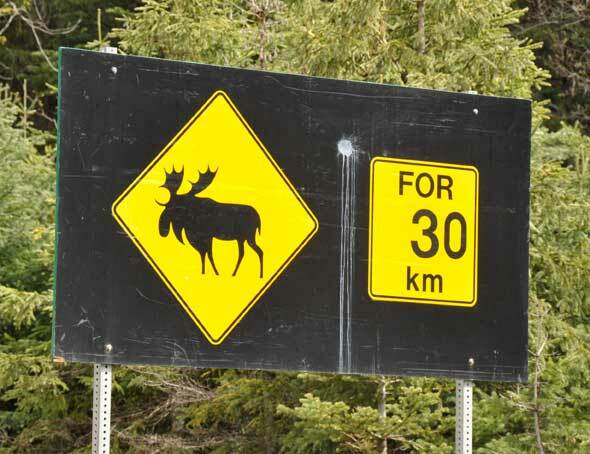 The trails were fantastic, winding through the hemlock and spruce forests, along the bays and up into the hills beside a waterfall. The birding was good as well. We saw an impressive four thrush species with varied, hermit, and Swainson's thrush in addition to the American robin. There were also lots of common ravens, bald eagles of course, ruby-crowned and golden-crowned kinglets, chestnut-backed chickadee (our fourth chickadee species for the trip!) and towards the end of the day some Townsend's warblers. Included in the mix were a young hermit thrush and young Townsend's warbler being fed by attentive parents. The wave action picked up slightly overnight, and while I live on a houseboat I'm not used to the swells of the open ocean! I slept, but not very well or very deeply, so I'm going to call it an early night and just post a briefer update about today. Make sure to check out the post below about crossing the Gulf of Alaska. 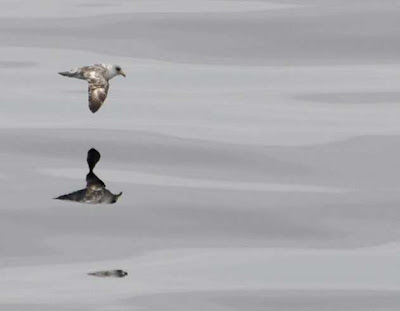 Yesterday I woke up to a black-footed albatross out the window, and today it was to cries of, "Whales!" I saw three humpbacks before even rubbing the sleep out of my eyes and many more as the day went on, as well as more playful Dall's porpoise. The wet weather has lifted and we even saw a peak of blue sky and some sunshine on a distant mountain. We pulled into Juneau, Alaska's capital city which is accessible only by air or water, right around noon. Our first stop was at Mendenhall Glacier - previously named Auke Glacier by naturalist John Muir after a local Tlingit tribe, or originally known as Aak'wtaaksit by the Tlingits themselves. 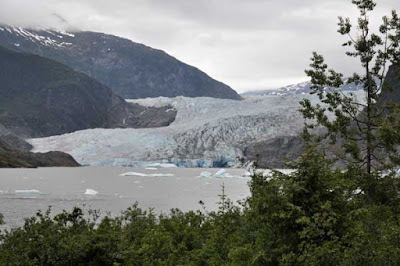 No disrespect to Mr. Mendenhall, the surveyor who never even saw the glacier, but I like the other names better. But, it is a beautiful blue glacier! 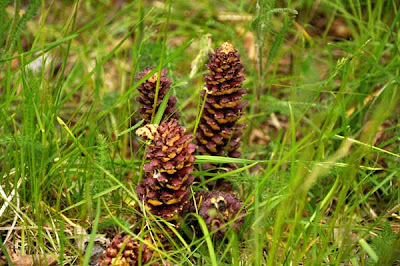 Nearby this bizarre plant, northern groundcone (Boschniakia rossica), was making a living parasitizing the shrubby alder trees. 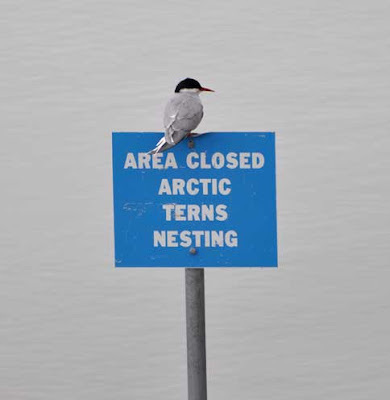 Arctic terns were nesting nearby, and we saw them snag fish out of the nearby lake and streams and feed their young. I was just about done for after that, and after a short walk through town I retired to the hotel for the night. Now for some restful, land-based sleep before catching an early ferry tomorrow for a couple of days in Sitka. It’s hard to believe, but it’s already time to begin our journey back south! We arrived in Whittier more than a day before the departure of our cross-gulf ferry, which meant we were left with 10 hours to spend in town between checking out of our hotel and departing on the MV Kennicott. I love small towns, but with the rain and fog we had yesterday I’ll admit it was tough to pass the time in Whittier. Nearly all of the towns 170 or so residents live in a single condo complex on one side of town, which is made up of two main streets, one on either side of the railroad tracks. We drove every little side street (many of them home to nothing but abandoned vehicles and junk piles), visited every store in town (all four or five of them), and spent an hour exploring around a creek outlet in the rain, and still had six hours until ferry departure! At that point we resigned ourselves to reading and playing games in the car. The boarding this time was much smoother than in Skagway, though part of that was because they knew it would take several hours so started early. There were no double-backwards 90 degree turns for driving on, though, which was good. It was interesting to see how they strapped down the cars, both front and back and left and right one very vehicle. We made our way to our cabin, which is surprisingly pleasant, and I found I could perch myself in the window to watch the scenery and scan for wildlife. This became my favorite place to sit, because most of the seating in the public lounges is poorly designed so that railings block your view. I woke up once for an hour and a half in the middle of the night uncomfortable with the motion of the vessel but this morning we awoke to amazingly flat seas. There was a slight rolling swell but nothing compared to the 10 foot seas they were expecting or the 30-40 foot seas they sometimes experience. I don’t get seasick but I don’t enjoy the rough rides so I was very grateful and the day turned out to be very enjoyable. 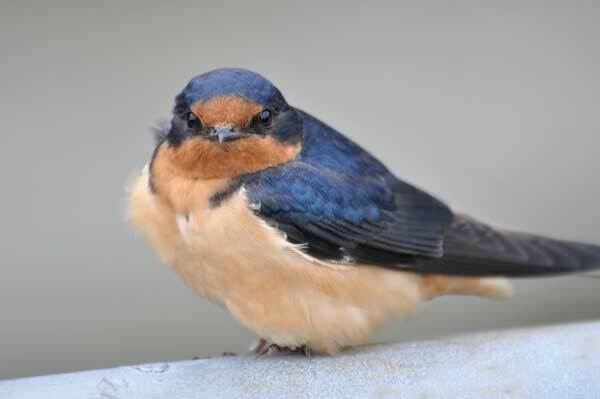 In fact, I woke up to shouts of “Bird! Right out the window!” which turned out to be a black-footed albatross (year bird 205). This is only the second time I’ve seen the species but it was amazing how fast they became “just” another albatross with all the other things to look at. 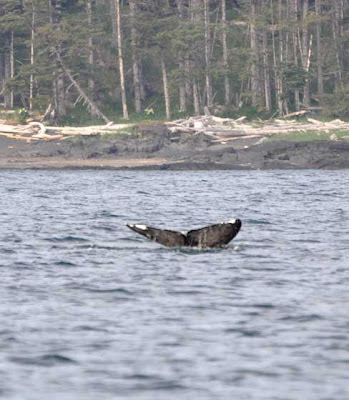 We were well away from land by this morning, but the Gulf of Alaska is a rich marine ecosystem. The weather had lifted and while it was overcast it wasn’t raining or foggy so I went out to the bow of the ship to watch for birds. While I was seeing lots of birds it quickly became apparent that identifying them would be a challenge because A) we passed them so quickly as we cruise at 16 knots and B) I’m not that familiar with pelagic birds and didn’t know what field marks to look for. My solution to this was to take advantage of every mega-pixel my camera had to offer and take pictures of the bird to compare to the field guides later if I wasn’t able to ID them by looking through binoculars. 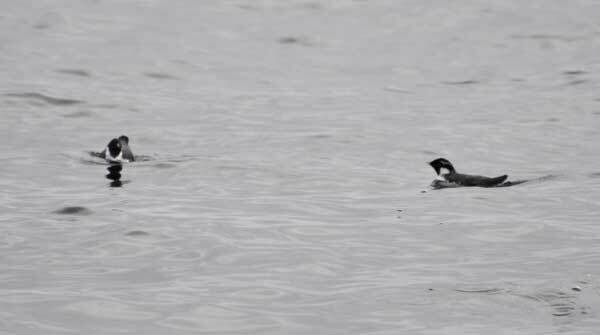 This actually worked quite well and in addition to the tufted puffins, northern fulmars (year bird 206), and group of four ancient murrelets (year bird 207), I was able to identify two new life birds. 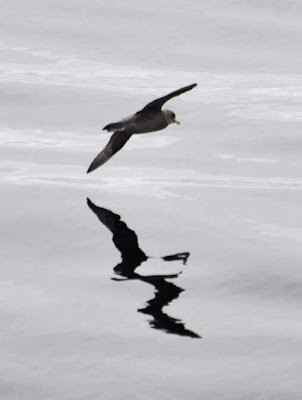 The first was the amazingly small fork-tailed storm-petrel (year bird 208, NA life bird 332). My first-ever storm-petrel after years of looking longingly at them as I flip by those pages in the field guide! There were several small groups of them about. The second proved to be more of a challenge and also more of a rarity – the flesh-footed shearwater (year bird 209, NA life bird 333). 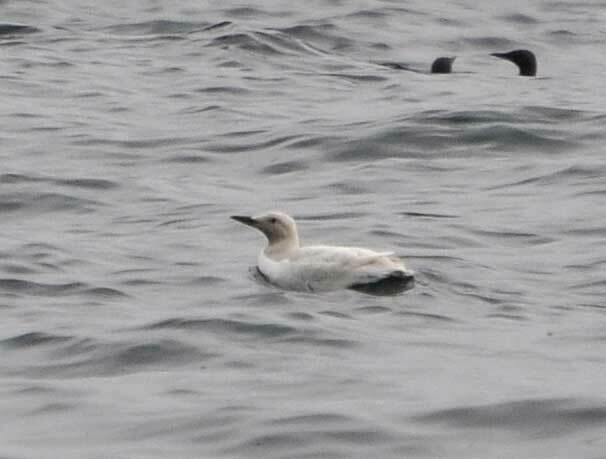 From a distance it was nearly impossible to distinguish these guys from a dark morph northern fulmar, but by zooming in on several different photos all the field marks were visible. 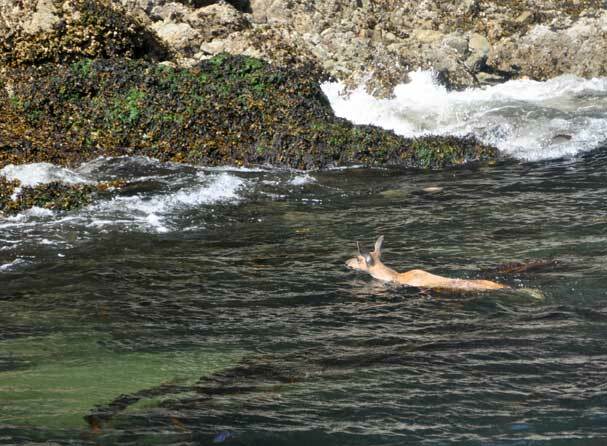 There were more marine mammal sightings today as well. 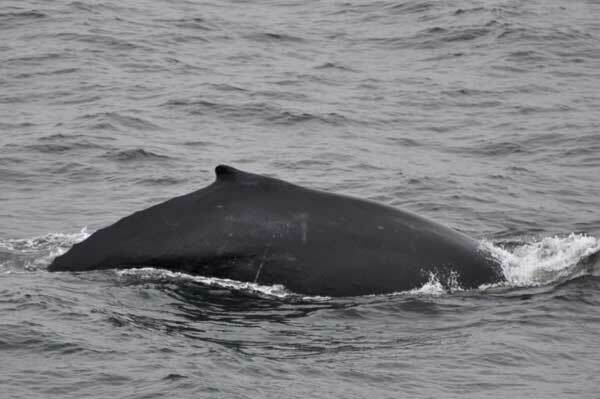 Multiple humpback whales were spotted (though I didn’t see any – too distracted by storm-petrels as it turns out! 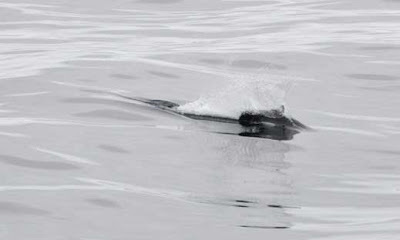 ), and several more groups of Dall’s porpoise. Rather than saying we found the porpoise it’s more accurate to say the porpoise found us. Off and on throughout the day a group of them would come zooming towards us in order to surf our wake. They’re such fun-lovers! Also, the most exciting mammal sighting of the trip as far as I’m concerned, northern fur seals!! Another new “lifer” for me. Today our only port of call was in Yakutat, Alaska. As we pulled into the bay about 20 eagles greeted us on the beach. Due to the smooth sailing conditions we actually arrived two hours ahead of schedule and had extra time to go ashore and walk around if we wanted. I was surprised to learn they had a visitor’s center in this small town, a National Park outpost for Wrangell-St. Elias which borders Yakutat. Before us ferry riders could even get off board the locals poured ON to the ferry. The kids came aboard the explore and many of the adults to drink in the cocktail lounge for the few hours we were in the harbor. As it turns out, just an hour before us the once-a-month barge from Seattle arrived carrying supplies and personalized orders, so this was a very exciting day in Yukatat! 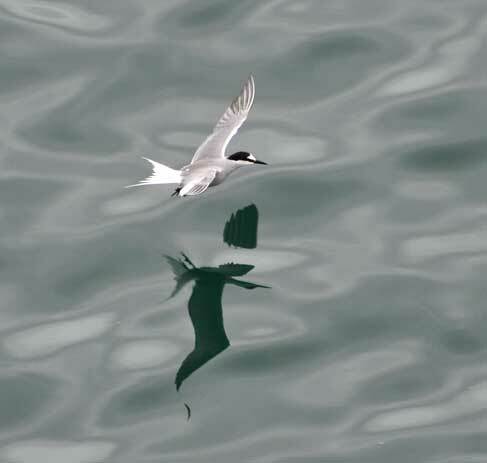 The most exciting part of Yukatat to me was seeing the Aleutian terns flying around the bay (year bird 210, NA life bird 334)! They were in a mixed flock with mew gulls and Bonaparte's gulls, and across the way were some cormorants - including a leucistic individual. How weird to see a white cormorant! As I write this now the gentle rocking of the ship is making me sleepy, so I will wrap it up here. By the morning we will be nearing Juneau, our stop for this leg of the ferry ride and where I hope I’ll be able to post this update.